Ms. 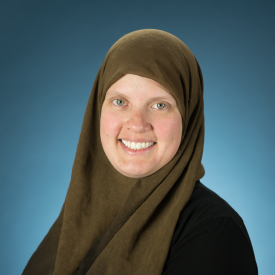 Crystal Walcott is proud to be continuing with Tarbiyah Academy for it’s third year. A state certified elementary school teacher, Ms. Walcott has a decade of experience in homeschooling, public school, and private schooling. She has experience in guiding students to succeed while inspiring an insatiable passion for learning and reading. She is trained to work with children from birth to sixth grade, and has also worked with students who have IEPs and behavior accommodations to enable success in the classroom. Ms. Walcott has a Bachelor’s in Elementary Education from North Carolina Wesleyan College and an Associates Degree in Early Childhood Development from Cape Fear Community College. Ms. Walcott strongly believes in the value of teaching through hands-on activities and through exploration. She values integration of all subjects as well as practical applications of faith throughout the school day. Contact her at cwalcott [at] tarbiyahacademy [dot] org.